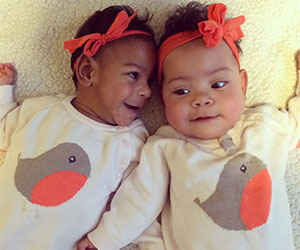 Born at 24 weeks and 1 day gestation, the twin girls’ chances of survival were slim. If they were to survive, they would face an uphill battle due to their prematurity. But that never stopped parents Nick Pryor and Alexis Host from believing their daughters would survive. They knew they had 2 little fighters on their hands. 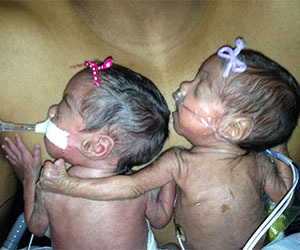 At birth, Lennix weighed 1 lb., 6 oz., while Charlee weighed just 1 lb., 1 oz. Due to their prematurity and size, the new parents were not able to hold their babies for days. Host was first when she held them against her bare chest in a type of mother/infant bonding known as kangaroo care. Pryor followed soon after, holding his daughters in the palm of his hand. Since their birth, the girls have undergone 12 critical surgeries between them, including a segmental bowel resection and a tracheostomy. Even with a less than 50 percent chance of survival at birth, the first-time parents never gave up hope, believing their daughters would overcome every obstacle, and they did. After 7 long months of restless nights at Akron Children’s NICU – some filled with optimism, others dread – the family was finally able to be home together. Lennix came home first just after Thanksgiving, while Charlee, who needed round-the-clock care due to her tracheostomy, came home just in time for Christmas. To hear more of their story, attend the Walk for Babies on Sept. 21 at the Akron Zoo, at 9 a.m. All of the event proceeds will benefit the NICU babies and their families. Online registration ends at noon on Friday, but walk-in registration are welcome for $20 per person. Learn more in this blog post.